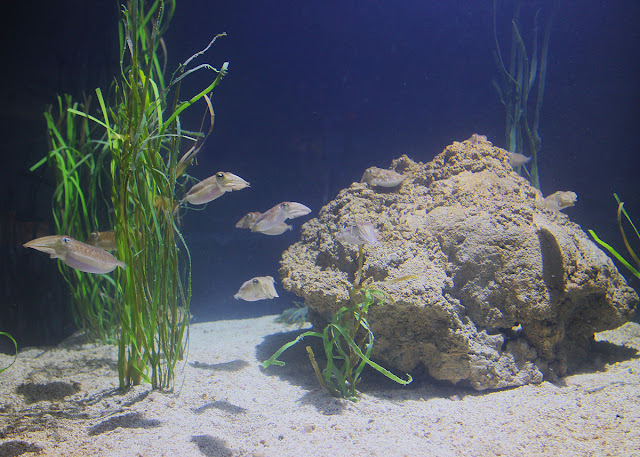 We just added 16 common cuttlefish (Sepia officinalis) to the cuttlefish exhibit. Yes, 16! But sometimes you might have to exercise your powers of observation to see these little guys. The juveniles often settle into different nooks and burrowed into the sand throughout the exhibit. We've pointed out just a few of them in this handy GIFs. These little guys have had quite the journey, starting their life at the Ripley's Aquarium in Tennessee (Fun fact: this species has black eggs. When the females lay the eggs, she places a small amount of ink into each egg!) and coming to us via Monterey Bay Aquarium. When they arrived back in January, they were just 2 cm long. They've grown to be 4 – 5 cm long! While they love to hide out, even timid juvenile common cuttlefish have to eat. They are fed a mixture of krill and small pieces of shrimp, and each one is slowly getting used to eating from a stick. Check out this short video to watch one of the wee cuttlefish creep past a hiding cuttlefish and grabbing a shrimp snack from the gravely bottom of the exhibit. We slowed down a portion of the video so you could get a better view of those tentacles. If you want a real treat, check out this super-slow motion video of a cuttlefish grabbing a meal. More amazing cuttlefish facts are on the blogs. Dive on in, the information is fascinating! Click on a link below for more pictures and video to learn more. Recently, a staffer had his camera phone recording as a brown banded bamboo shark laid an egg in The Trust Family Foundation Shark and Ray Touch Tank one evening. It was a special moment that not everyone gets to see, so we're happy to share it here! This short informative video shows where the adult sharks live, what the eggs look like as the tiny sharks are growing inside, and where juvenile sharks mature. Our newest exhibit is beautiful to behold. Visitors have been wonderstruck by the diversity of species, the colors, and the artistic elements, like the rock formations inside and the sculptural rails along the outside. 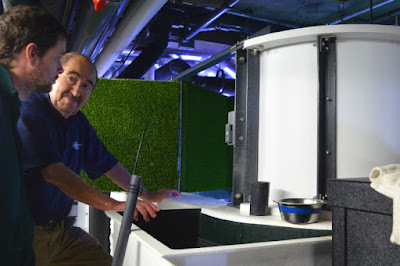 You might be interested to know that as much care went into designing the exhibit behind the scenes — especially the giant Pacific octopus habitat. 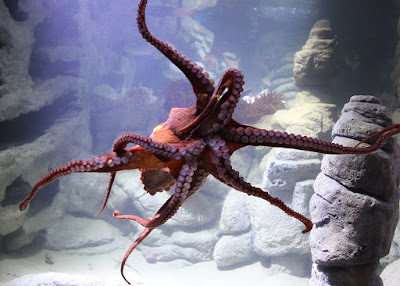 You see, octopuses are strong, have flexible bodies and can learn and problem solve. Oh…and they have LOTS of suction cups. The giant Pacific octopus, like the ones in our new Olympic Coast Sanctuary exhibit, has over 2,000 of these sticky appendages! The octopus can taste and smell with the suckers and use them as a mode of transportation. If an octopus can grab hold and stick to a surface, the animal is strong enough to pull itself along, including in a vertical direction. This makes it possible for an octopus to climb over an exhibit wall. Since we want the best home possible for the animals in our care, staff took every precaution to make our newest exhibit a healthy, safe place for the octopus. The first line of defense? We give our animals enrichment activities, like puzzles and playtime, in addition to their regular stimuli and feedings to ensure the octopuses are physically and mentally challenged. In addition to the puzzles and enrichment, aquarists simply make sure the exhibit is designed in a way that doesn’t give the octopus any way to climb out anyway! Our past public exhibit had a large, heavy lid, one that the octopus couldn’t lift and thus prevented walkabouts. But with the new exhibit, aquarists were interested in keeping the top of the exhibit open for easier access. So what to do? The first step to preventing a wandering octopus is to create enough distance between the water line and the top of the exhibit. 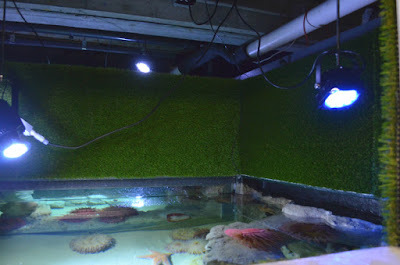 Behind the scenes, there’s a tall wall enclosing the octopus tank. 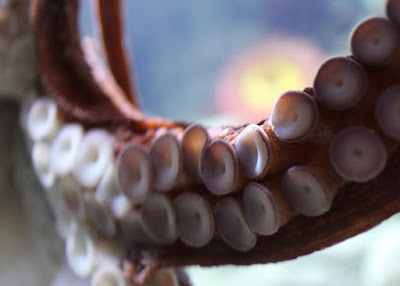 At close to 2.5 feet, that distance would be difficult for the octopus to move without water. 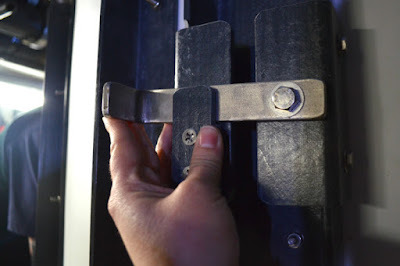 Doors opening to the top of the exhibit are held closed by heavy latches. However, we took extra precautions and covered the tall wall and doors with a prickly material. What is this miracle octopus deterrent? Surprise…it’s AstroTurf! AstroTurf has been uses for the past several decades to prevent giant Pacific octopuses from getting out of their exhibits. It’s easy to use, aquarium safe and has enough air space to prevent an octopus from sticking to it. If you’ve ever tried to stick a suction cup to a window or your GPS to the windshield of your car, you know that you need a good seal. A little gap lets air underneath and the strong hold is broken. 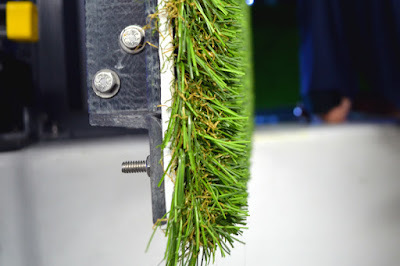 The same idea works for the octopus and AstroTurf: the grassy blades of the turf prevent the suction cups from getting a tight seal. No seal, no sticking, and no sticking means no climbing, which means no escaping octopus resulting in happy aquarists! 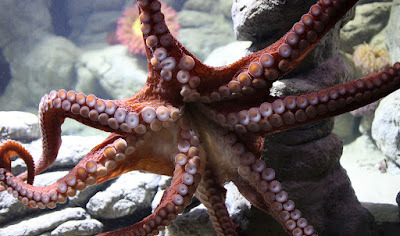 So while Inky is world-famous for his escape back into the ocean, we’d rather have our octopuses "stick" closer to home. And while you can’t see the behind the scenes walls of the exhibit, know that it’s covered in green artificial grass. Perhaps the “Astro” should stand for “Anti-Sticking-To-Repel-Octopus” turf. With this octopus deterrent in place, the Aquarium ensures that our octopuses will stay put and not repeat Inky’s miraculous escape. 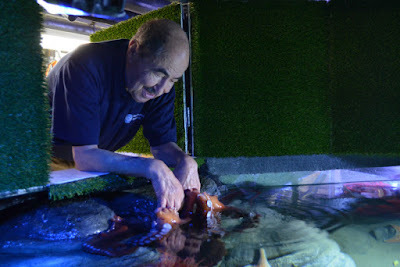 Make sure to come visit the giant Pacific octopus soon—you know they will be there!